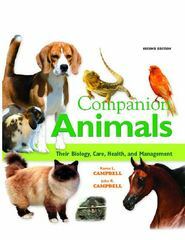 Companion Animals 2 Edition Comprehensive and up-to-date, this book makes a useful reference devoted to companion animals. It provides underpinning principles and time-tested practical information for those preparing for careers related to the health and quality of life of all creatures–with special emphasis on companion animals. Chapter topics include choosing a dog or cat; companion birds, reptiles, amphibians, rodents, ferrets, and lagomorphs; medical records and case histories; feeding and nutrition; care, management, and training of dogs and cats; fitting, grooming, and showing; companion animal health; kennel/cattery design and management; career opportunities associated with companion animals; and trends/future of companion animals and related functions. For pet food manufacturers, pet stores, pet owners, pet breeders, and veterinary medical groups.